When the subject of education and digitization is raised, the principle of “pedagogy before technology” is very frequently cited these days. While this may appear a reasonable demand at first glance, on closer scrutiny it becomes clear that this is a motto that is trivial at best – and at worst may even prevent the possibilities of digital media from being used in a meaningful way. Technology should serve humans, not vice versa. One should initially focus on the core business of teaching before bringing technology into the classroom. Educational decisions must be given priority over technological decisions. These interpretations are critically analysed below. One prominent proponent of the idea that technology should be subordinate to humans is the Augsburg media pedagogue Klaus Zierer. His 2017 book “Lernen 4.0” (i.e. Learning 4.0) is even subtitled “Pädagogik vor Technik” (i.e. Pedagogy before Technology). Anyone who supports the theory that technology should serve humans (rather than vice versa) can be sure of garnering widespread approval. Yet this approval comes at a high price, for there is de facto not a single education expert who would seriously defend the idea that humans should serve technology. A theory with which everyone agrees and whose opposite no-one believes true is meaningless, however. In this interpretation therefore, “pedagogy before technology” does not constitute a substantial theory about which one could argue scientifically; it is simply a triviality. This does not automatically render the principle worthless, however. After all, even something whose content is trivial may fulfil important functions. “Pedagogy before technology” is useful above all as an admonitory wake-up call when educational institutions risk being blinded by technological possibilities that cause them to neglect pedagogical principles that should really be taken for granted. Pedagogy is illustrated in this case by a book, a pencil and writing. Pedagogical activities thus mean teaching students to read and write, for example. Technology – in the form of a tablet on which the shapes of letters to be drawn are indicated by small arrows – remains in the background. What began with the invention of writing was taken to the next stage when the printing press was introduced. The early modern era was influenced to a major extent by the fact that writing and printing competed for a leading role in information technology. In all its unprecedented complexity, the printing press – dubbed the ars nova ingeniosa – was seen as the high-tech of the fifteenth century (cf. Giesecke 1998, p. 67). By contrast, we have come to take writing and typography so much for granted that we hardly even perceive their technological nature any longer. That can result in the mistaken assumption that lessons based on books and writing are characterized by an educational approach that does without technology entirely. When considering the relationship between pedagogy and technology, however, it is essential also to identify writing and books as classroom technologies. Against this backdrop, the principle of “pedagogy before technology” reveals itself in the current debate to be an appeal to uphold traditional educational approaches: “Focus first on books and writing before you think about including (digital) technology in your (didactic) considerations!”. However, anyone who follows this call not only fails to recognize just how much traditional pedagogy is influenced by the “technology” of books and writing. From the books and writing perspective it is also very difficult to adhere to the principles of contemporary education. The third interpretation of the “pedagogy before technology” principle is a variation of the idea already alluded to in the second interpretation. The theory that pedagogical decisions should be given priority over technological decisions as a matter of principle likewise obscures the extent to which educational activities and decisions are also influenced by the available technology. When planning a lesson on the basis of this principle, one first needs to set out the objectives to be achieved and must then decide in a second step which methods will best allow these objectives to be achieved. The blind spot in this approach is currently evident in the debate about the added value created by digital media. This added value appears only to be generated if the goals that have been set can be reached better, more quickly and more lastingly with digital media than by traditional methods. This ignores the fact that the teaching goal dimensions are not independent of the available framework conditions in terms of media and technology. Put simply, the goals that can be realistically achieved in a lesson based solely on books and writing are significantly different from the objectives that can be pursued using books, writing, tablets and the Internet. Thus the true added value offered by digital media is not that they allow old goals to be reached more quickly, but that they enable entirely new objective dimensions to be opened up for the first time – ideally dimensions that will have social and individual relevance (cf. Rosa 2017). The motto of “pedagogy before technology” distorts not only the way in which these relationships are viewed, but also the way in which we see the fundamental changes that are crucial during the phase of key media transformation: it is a question of society as a whole being immersed in “a new medium to think and imagine differently” (Manovich 2013, p. 13) through the culture of digitality (cf. Stalder 2016) – a medium in which terms such as “learning” and “knowledge” acquire new meanings (cf. for example Weinberger 2011). From the “pedagogy before technology” perspective, these complex relationships, which are so important for our understanding of the culture of digitality and of the changes in the field of learning and teaching, remain largely invisible. It therefore comes as little surprise that the theory of “Learning remains […] Learning – be it digital or not” (Zierer 2017, p. 53), which is problematic on a number of levels, is seamlessly integrated into a body of thought in which the principle of “pedagogy before technology” is attributed central importance. Those who appeal for “pedagogy before technology!” often fail to recognize the nature of technology and ignore the influence technology has on pedagogy and the influence media have on culture and society. This principle is trivial at best; at worst it constitutes one element of a theory that is not suitable for appropriately describing – let alone analysing or designing – learning and teaching under the conditions of digitality. Giesecke, Michael: Der Buchdruck in der frühen Neuzeit. Eine historische Fallstudie über die Durchsetzung neuer Informations- und Kommunikationstechnologien. Frankfurt am Main: Suhrkamp 1998. Klafki, Wolfgang (1961): Studien zur Bildungstheorie und Didaktik. Unveränderter Nachdruck der Auflage von 1975. Weinheim und Basel: Beltz 2010. Manovich, Lev: Software Takes Command. New York/London/Oxford/New Delhi/Sydney: Bloomsbury 2013. Ong, Walter J. (1982): Orality and Literacy. The Technologizing of the Word. London/New York: Routledge 1988. Weinberger, David: Too big to know. New York: Basic Books 2011. 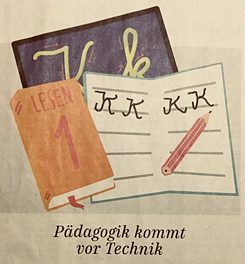 Zierer, Klaus: Lernen 4.0. Pädagogik vor Technik. Möglichkeiten und Grenzen einer Digitalisierung im Bildungsbereich. Hohengehren: Schneider 2017.